Ray Michelena is an AWS-certified resistance-welding technician with more than 20 yr. of experience with resistance welding. As a resistance-welding seminar instructor and service tech with T.J. Snow (www.tjsnow.com), he travels regularly to metalworking plants nationwide. 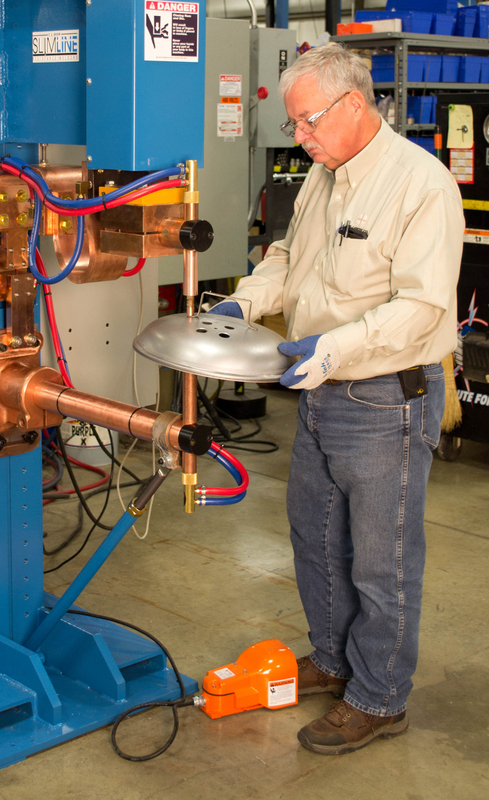 Properly applied, the resistance spot-welding (RSW) process provides a fast, reliable and cost-effective means for joining sheetmetal. However, although RSW has been used in manufacturing for decades, the process still is not well understood outside of the automotive industry. To consistently produce high-quality resistance spot welds, fabricators must carefully control the process variables—pressure, current and time. RSW is unique because it provides a high-speed joining method using a forged weld joint created through the application of accurately controlled electric heat and force, without the addition of filler metal. The process looks simple, but fabricators must fully understand the process variables in order to achieve the desired result: a weld stronger than the parent material. In fact, often the welds must be cosmetically appealing as well as strong, which presents additional challenges to welding-machine setup personnel. Fabricators must control three main variables to successfully create resistance welds: pressure (forging force), current (the amount of welding amps used), and time (the duration of current flow)—PCT. Without understanding the importance of these variables and their relation to one another, weak welds or weld failure often results. Unfortunately, the RSW process often gets blamed for these problems, in some cases causing users to adopt a more expensive and slower joining method, such as arc welding, riveting or adhesive bonding. A recent visit to a customer’s plant illustrates how improper RSW machine setup can lead to weak or failed welds. In this case, the setup tech assumed that a long weld time would result in stronger welds. However, we proved otherwise. Why won’t a long-duration weld time produce a better weld, when it would seem that “cooking” a resistance weld with extra heat and time would add to its strength? Just like baking a cake, the right PCT recipe is critical to achieving a successful outcome. While too little current-flow time will result in a weak weld, trying to overcome this issue using excessive weld time causes the heat-affected zone to grow too large, which weakens the joint and can produce an excessive indentation, or expulsion. and T = time, or the duration of current flow measured in cycles (Hz). 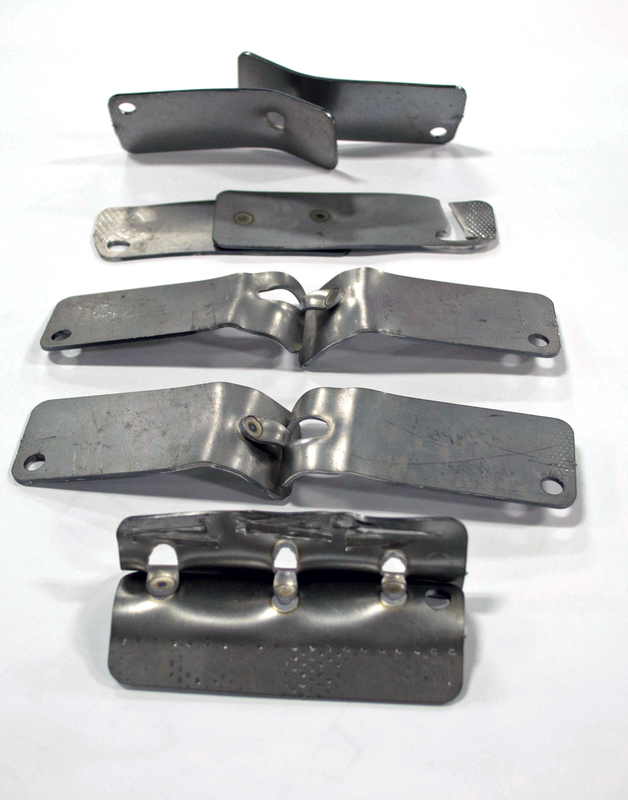 The RSW process looks simple, but fabricators must understand well, and control, the process variables in order to achieve the desired results: a weld stronger than the parent material (illustrated here by a series of pull-test samples). To optimize the RSW process, fabricators should use high secondary welding-current settings, typically 5000 to 20,000 A. Current produced by the welding machine’s transformer is conducted to the workpiece via copper arms and welding tips (electrodes) at a very low secondary voltage, typically 3 to 12 V.
Think of an overly long weld time with too little current this way: No matter how long you leave a pan of water on the stove, you cannot make the water boil without sufficient heat. Or, think about baking biscuits: To end up with consistent, delicious biscuits, we must follow a recipe that calls for carefully measured ingredients baked for a specific length of time. The same is true with the RSW process—fabricators must follow a recommended recipe (weld schedule) that specifies the proper amount of PCT. The American Welding Society (AWS) and other sources publish recommended weld schedules for most combinations of metal alloys and workpiece thicknesses. For example, when welding two pieces of 18-gauge low-carbon steel, the recommended machine settings are 660 lb. of pressure, 9600 secondary amps and eight cycles of weld time. (Note: Since most RSW machines do not display these variables, fabricators should use a weld monitor that displays weld current and time, and an electrode-force gauge during machine setup). Long weld times often are used when trying to correct a problem with weld-joint strength. However, if your weld times are too long, that variable is not in the correct “portion” to weld the material, according to the PCT recipe for the workpiece material. 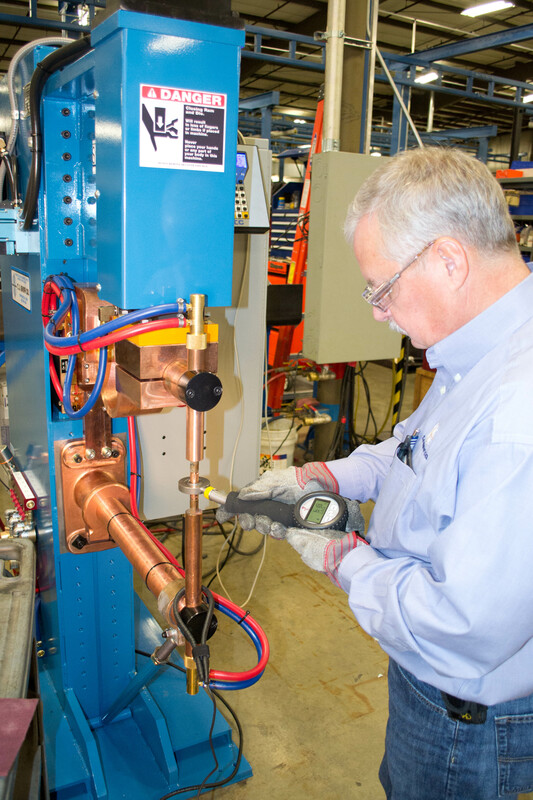 Since most RSW machines do not display the critical process variables, fabricators should use an external amperage meter and force gauge during machine setup. In addition, excessive current or insufficient pressure may cause the spot weld to “boil over”— called weld expulsion. Excess weld pressure reduces interfacial resistance and results in a weld that’s too cold. Attempt to overcome this by adding more weld time and you still will not bring the material to a molten state. Instead, you will cause excessive heating in the area surrounding the weld—the heat-affected zone—which may affect weld strength. The heat required to create each spot weld is generated by the base material’s resistance to current flow. Copper used for the RSW machine’s conductors is considered to have a value of 100-percent conductivity, while the conductivity of mild steel is approximately 10 percent. So, with a given amount of current passing through equal volumes and sectional areas of copper and steel, the resulting heat generated in the steel will be approximately 10 times greater than in the copper. All of the resistance values in the weld circuit are considered to be in series, and the heat generated at any location is proportional to the value of the resistance at that point. We can assume that the faying surface (where the two workpieces come into contact) has the highest resistance and therefore will generate the most heat. This interfacial resistance should generate enough heat to bring the faying surfaces to a fusion temperature of approximately 2700 F.
If the heat generated at any one spot is proportional to the value of the resistance at that point, how can we control the resistance? In an electrical circuit, pressing contacting surfaces together with high force reduces resistance and, therefore, heat generation. So, by varying the force we can increase or decrease the resistance and control the amount of heat in the weld joint. At the same time, we can control current passing through the weld joint by adjusting the transformer’s tap switch (if equipped) and the percent-current setting on the machine’s electronic control. Electrical current, passing through the resistance of the weld-zone interface, creates the required heat; application of the electrode pressure on the weld joint forges the molten material. As a result, the molecules fuse together to form the weld nugget. Getting back to our customer who believed that an extremely long weld time was the answer to producing strong spot welds, we proved through destructive testing that only eight cycles of weld time would produce a much stronger weld joint than the 73 cycles of weld time being used prior to our arrival.